For new and experienced walkers alike, Safety on Mountains is packed with advice. Whether planning a short summer walk or a multi-day winter trip, Safety on Mountains highlights the essentials skills and techniques. Safety on Mountains has been in print for over thirty years; this new edition is packed with up to date information and advice, making it the perfect hill walker’s handbook. Buy a gift from a range of exclusive Tessa Lyons-designed merchandise for Christmas and the profit will go towards the care of our hills, mountains and National Park landscapes. To celebrate the public launch of BMC TV's Hard Rock film, the clothing is now even cheaper to buy! 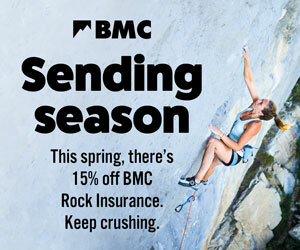 BMC members can get a tee for a rock-bottom price of £8 or a hoody for a bargain £15 from the BMC Shop. Climb the routes, then wear your tick list with pride.